Kids Clothing Week Spring 2013 is starting in a few days and Meg invited me to share my favorite pattern over on the KCW blog as part of the weeklong wind up. I chose the Geranium Dress/Tunic pattern by Made by Rae. There aren’t a lot of patterns that I make more than once, but this one is so classic that I find myself coming back to it again and again. You can see my full review and my past Geraniums over on the KCW blog. And in honor of the post, I made a fun new tunic for Yuki! 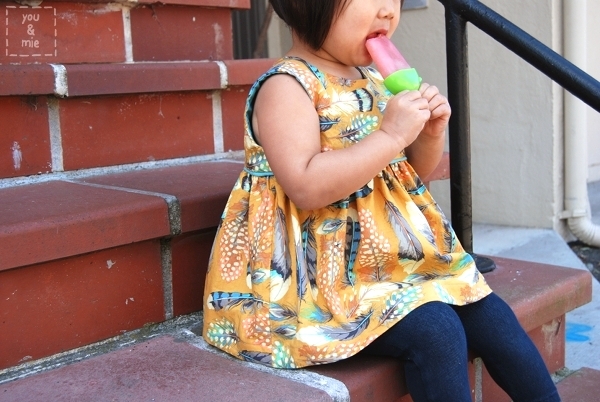 There are a ton of different variations of this top you can make, but I decided to go with something simple – sleeveless tunic, scoop neck, and a gathered skirt – since I had chosen such a busy print. I bought this feather print by Martha Negley awhile back from Stonemountain and Daughter because I loved it, though I wasn’t sure what I was going to use it for. One of the great things about the Geranium pattern is how much you can change it up – pick a detailed print and keep the style simple, or choose a simple fabric and really play up the details. I love this pattern!! 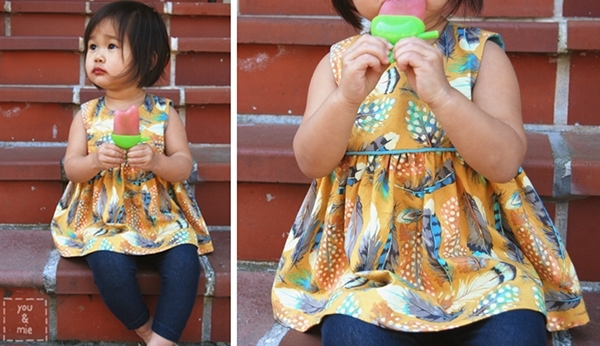 And now that the weather is warming up, it’s the perfect time to fill someone’s lil wardrobe with Geraniums! Have you started planning or prepping for next week? I’ve barely had a chance to think about it, but my goals are to not buy any new fabric and to sew with patterns I already own. We’ll see what I come up with! So what are you going to be sewing next week for KCW?? So I haven’t been blogging much recently, but I’ve been busy with some really exciting projects that I’ll be announcing within the next few weeks (including my first blog series)! The first of those projects was the opportunity to share with you a new Oliver + S spring pattern that has yet to be released! 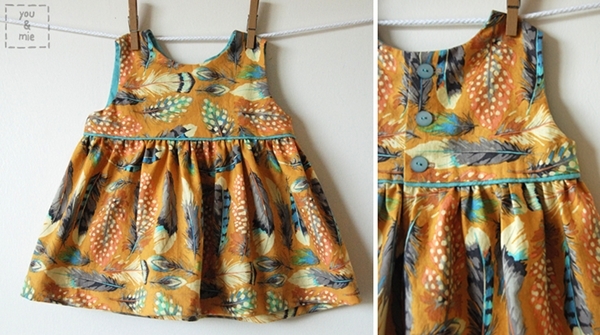 If you sew kid’s clothes, you’ve surely heard of Oliver + S patterns. And if you’ve heard of them, I’m sure you’re a big fan AND know that they are releasing two new patterns within the next week! 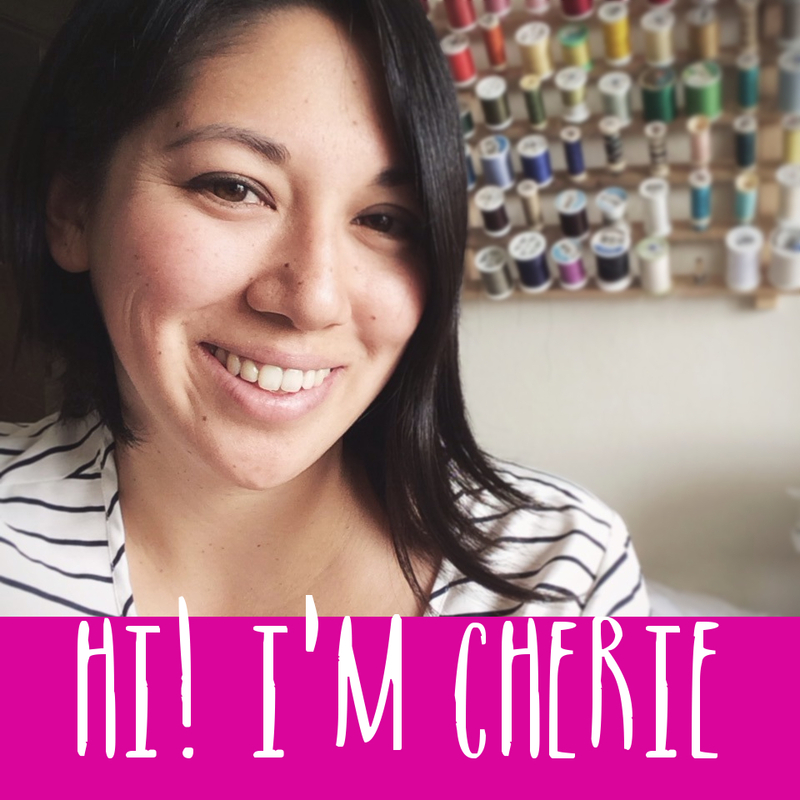 So when Liesl (the creative mastermind behind Oliver + S) asked Kristin to sew up the new patterns to share with readers and customers and Kristin asked me and Jessica if WE wanted to sew them with her – I’m pretty sure I shrieked. You would too, wouldn’t you?? And so I present to you, the last stop on the Oliver + S Roller Skate Dress + Tunic Rolling Tour! 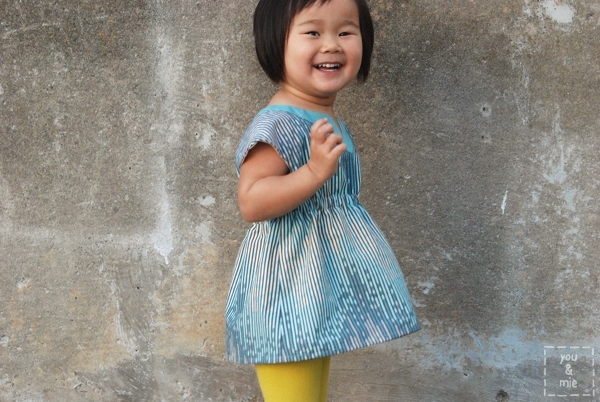 The Roller Skate Dress + Tunic is one of 2 new patterns being released for the spring line. 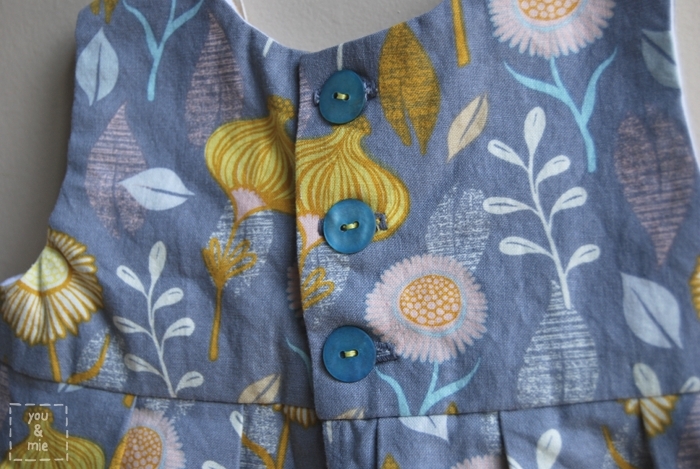 It is a simple and adorable addition to any spring wardrobe and is a pattern I can imagine sewing up over and over again in different variations. The pattern comes with 4 views or styles. View A is a dress and you can see Kristin’s sweet floral version here. 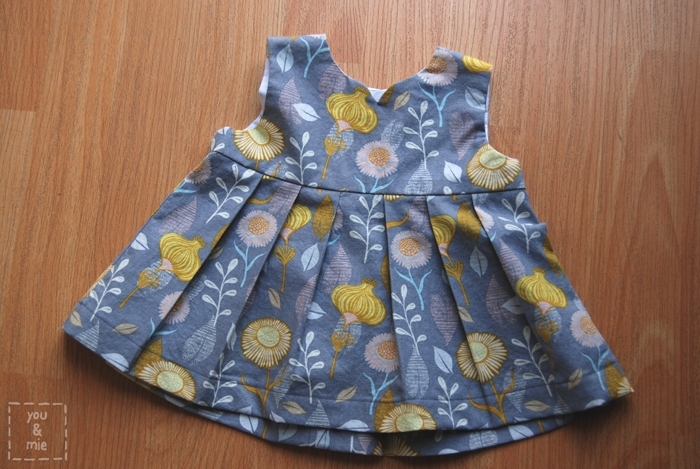 View B is a dress with a visible yoke and I think this version that Liesl made is particularly cute. 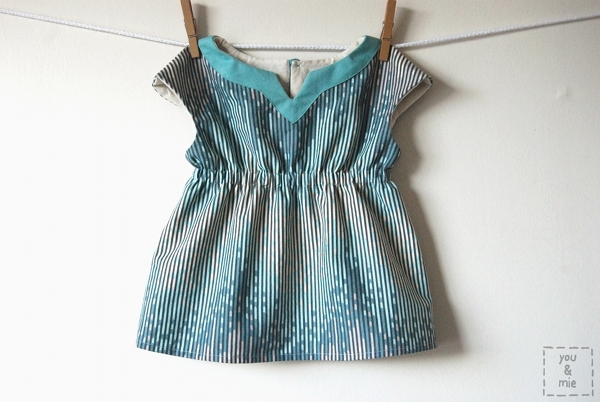 Jessica made a reversible version of View C, which is a tunic (totally loving the gorgeous tribal print she used). And I made View D, a tunic with the visible yoke in contrasting fabric! This pattern is really a simple and fast sew, but produces a stylish and professional looking top or dress, which is my favorite kind of pattern! It’s fully lined, has faux cap sleeves and an elastic waistband for shape and comfort. 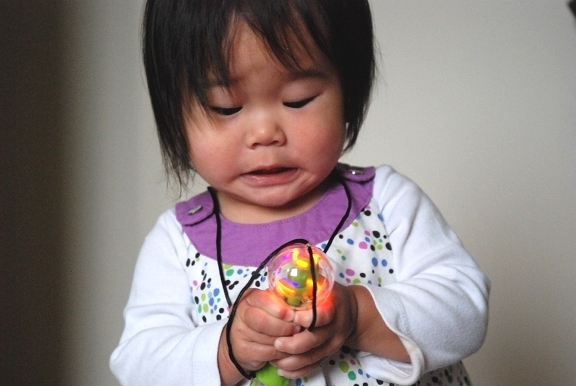 It closes in the back with a simple button and button loop (no zippers or button holes! ), so that makes this pattern appropriate for beginners. I love the optional visible yoke – it adds a nice finishing touch. My V notch on the neckline got a little deep because the first time I sewed it, it was crooked, so I had to make it bigger to even it out. 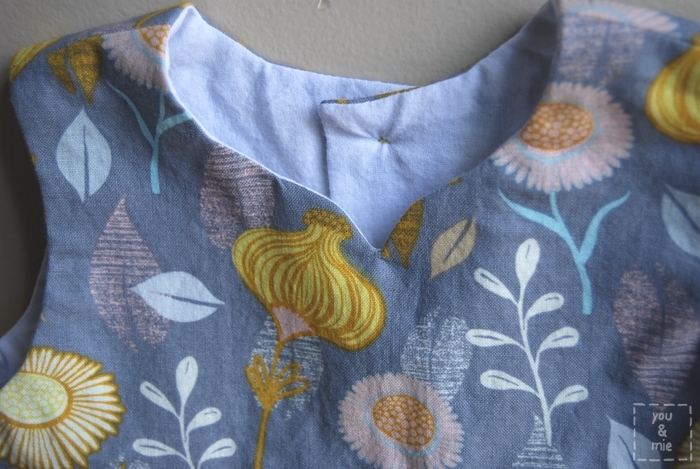 My advice if you do the notched neckline is to really take your time with it. If it’s off even by a little, it’ll be very noticeable! I made it in 2T and it fits my daughter perfectly. I was a little confused by the chest measurement listed for the finished garment because it seemed way too big, but I realized that that’s the measurement before you add the elastic. So just go with the body measurements table (or whatever size you normally sew with O+S patterns) and you’ll be good! This style is very forgiving in fit. 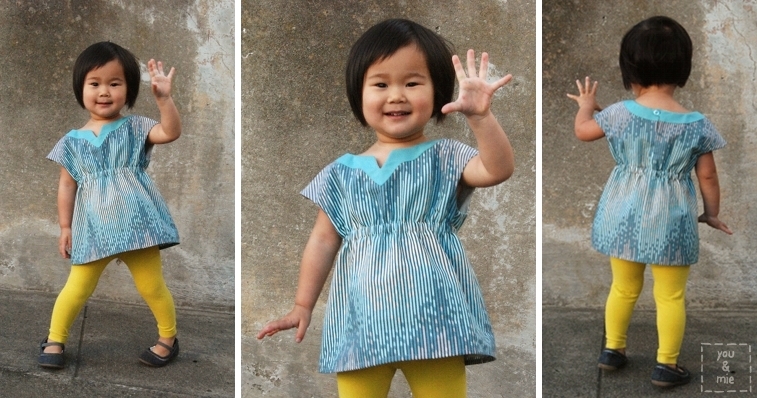 This pattern delivers all the wonderful things you’ve come to expect from an Oliver + S pattern. It’s professional and beautiful, with great diagrams and directions. There is so much useful sewing information in each pattern that you always come away feeling like you’ve taken a class or learned at least one new sewing technique. I used this really cool fabric by Tula Pink called Sea Stripes from the Sea Water line. 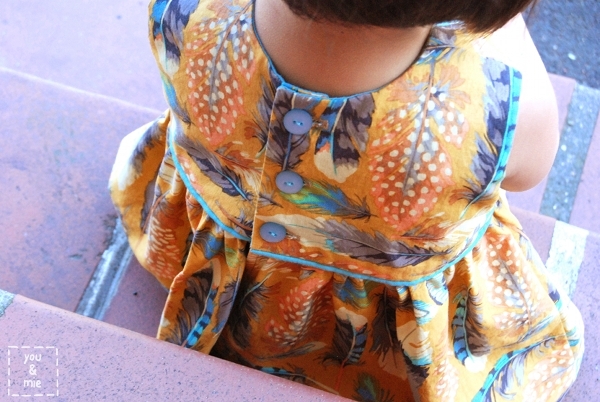 I picked it up from one of my favorite Bay Area fabric stores, Stonemountain and Daughter. I was drawn to the creative print and bought a bunch, not knowing what I was going to do with it. I really love it with this simple pattern though! And seriously, this pattern has so many possibilities. When trying to decide what fabric to use, I picked out a huge stack from my own stash that I thought would look great as a Roller Skate tunic. The hard part was choosing which one to go with. But the good news is you really will sew this pattern over and over again – it’s just a great staple to have in your collection. In other news, Yuki has started to explore new modeling poses. In this one, I’m pretty sure she’s channeling Em’s dancing spirit. And I don’t even know what this pose is about, but hey – I’ll take it! So there it is, the Roller Skate Tunic (View D). The pattern will be available through the Oliver + S website starting tomorrow. I bet you already have something perfect for this little dress or top already in your stash, so you’ll be able to get started right away! 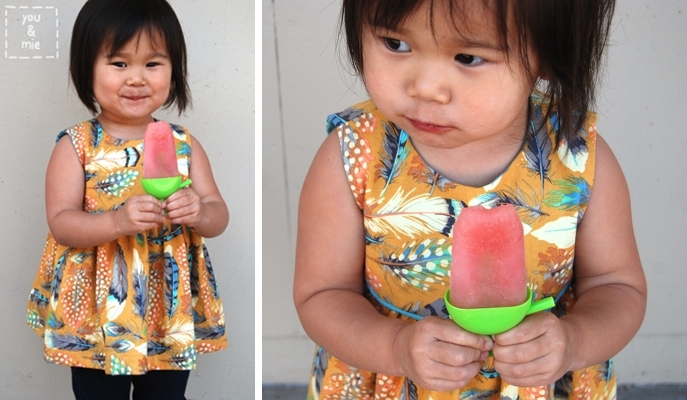 If you haven’t already, stop by skirt as top and a little gray to see their awesome versions of this pattern! 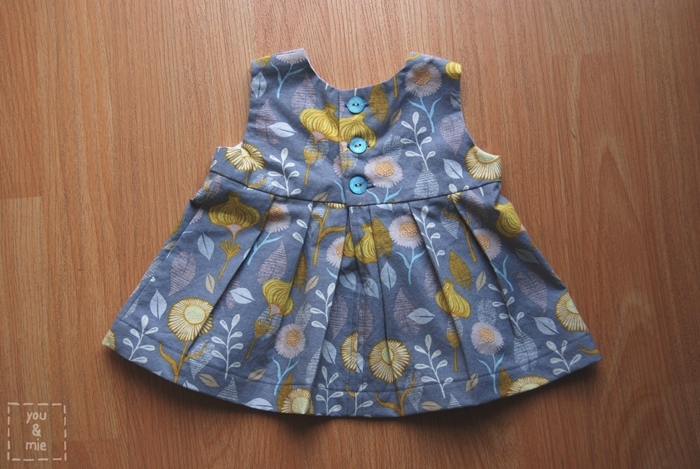 Thank you, Liesl and Kristin, for letting me sew this incredible new pattern to share with everyone! 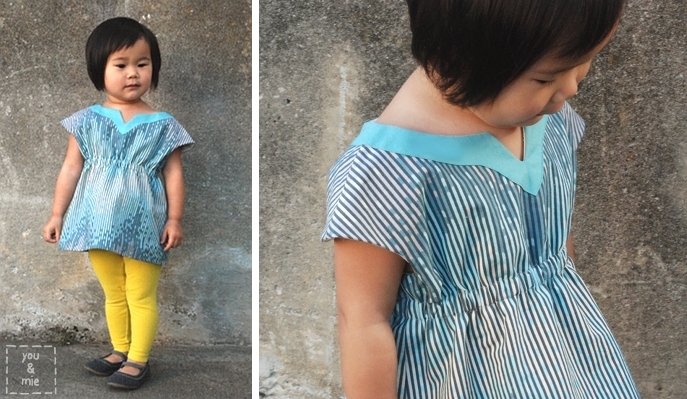 Next up, is the Pinwheel Tunic + Slip Dress!